The Benaki Museum for Islamic Arts is located in a busy road in the tourist-packed Monistraki district of Athens, the Greek capital. Under the Acropolis hill, where the Parthenon temple stands, a five-storey high building, with its collection of Islamic artifacts covering the 14 centuries of Islam, is host to a rare event happening in the agora of ancient Athens. An exhibition of photographs documenting the changing nature of the Sudanese Nile valley, from antiquity to present time. This 80-pictures-large exhibition, is a genuine labour of love by archaeologists Alexandros Tsakos and his wife Henriette Hafsaas-Tsakos, a Greek-Norwegian couple, whose dedication to furthering our understanding of the Sudanese past is unquestionable, creative and thought-provoking. The two researchers’ enthusiasm for Sudan is evident through this collection of images that captures several themes that are of great relevance to a new generation of young Sudanese and Sudanphiles. But it is also a chance for visitors, Sudanese or otherwise, to ponder the fate of the country. The images contrast between the Meroitic pyramids, where monarchs of antiquity rest, with the Qubbas or shrines of Sufi saints, ancient temples and medieval mosques, the duality of the Nile and its deserts, of old rituals and new practices, Christianity and Islam, mud bricks and concrete walls. Walking around the exhibition halls, from floor to floor, the pictures are laid out in a meticulous manner and arrangement as to fit in with the museum’s layout. The pictures are introduced with simple extracts of verse encapsulating the human traits that bind us all together. Visitors to the exhibition are handed out a map of the Northern Sudanese or Nubian Nile valley from Khartoum to Aswan. Places are named in English and Greek, as whilst English was introduced as international language to Sudan by its last colonizers, Greek was the language that for millennia had been used to document and communicate with the Nubian valley. Visitors are introduced to Sudan’s Sufi or mystically inspired Islam. A tolerant religiosity that transcends time and is deeply rooted in the way the Nubians have held their faith in the Creator of the Nile, from the old dynastic times through the era of the Christian creed, and now in the age of Islam. No image in the whole collection presents this tolerance as the one showing children of a Nilotic southern Sudanese family playing near the gate of their house in a village in the heart of the Mahas. The door to this family’s home is adorned in true Nubian fashion with Christian crosses with a rather large one on the door. This contrasts to the Islamic symbols that are used by their Nubian neighbours. A set of images captures the Friday afternoon Zikir at the shrine of Omdurman’s Qadri saint, Shaykh Hamed al-Nil Al-A’raki. Images of prayers in prostration, capture the significance of prayers to the faithful. The visitor is subsequently taken into a quick journey into the meaning of the Mosque. 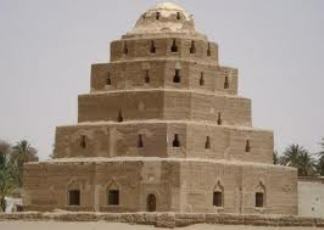 How the shrines of sufi saints could be seen as a historical parallels, a form of cultural continuity, to the Tarabeel, as the pyramids of northern Sudan are locally known. The images carry subtle hints to the realities that impact the lives of those living in Sudan. One picture captures a hole made by a mortar shell on minaret in Midan al-Khalifa opposite the dome of Al-Mahdi in Omdurman, when forces of the Darfur rebel group, the Justice and Equality movement, launched an ill fated, albeit daring attack, against the seat of the NCP regime in Khartoum in May 2008. Water a most essential requirement for survival in the Nubian desert is celebrated by the photographers in all the different forms it impacts the lives of the Sudanese. One set of photos brings a genuine Sudanese object to the fore of our attention. Clay pots that hold cool water for the thirsty, or for those seeking ablution for prayers, the Zir. A Zir by a Qubba in Abu Haraz is important for those visiting the Wali, as it is the Baraka-blessed water that quenches the thirst of the seeker. We see water as rain, and how children of the Manaseer in the Fourth Cataract, before its flooding by the Merowe dam, were jubilant when raindrops caressed the banks of the river they knew for generations. We then sail on the river, with Bantoons, Marakib, Falukas all boats on the river, before we encounter the artificial lakes of the dams, and the pristine ancient banks they flooded. This gently weaved thread of narration gives the viewer a warmth of feelings harboured by the Greek Norwegian mission for Sudan. However, the exhibition is most of all, a gentle appeal to sensibility. It raises concern and urgently calls for action, from the Sudanese and their friends worldwide, to pause and rethink once again as to how they want their country to develop and at what price? This point, although not explicitly spelt out by the Athens celebration of the Nubian Nile, which is after all a cultural event, not a political protest, is one that all Sudanese need to address immediately. Politics are never too far from all affairs Sudanese, with plans to build more dams and reservoirs along the Sudanese Nile and its tributaries; be it in Dal, the Third Cataract, Al-Setait or any where else, the need for action can not wait. Many Sudanese needs are concerned with the development of electric power, but there are alternative options that are more cost-effective and environmentally sound, to hydro-generated electric power. We should not hark on Egypt of the 1950’s for inspiration; after all, this is the 21st century. There are several other options for the Sudan, mainly in developing solar and wind generation alternatives. For the lobby calling for utilizing the river’s waters, there are better ways than changing, and forever, the nature and the environment of the age-old Nile. However, one particular lobby, which reigns supreme in Khartoum, is that one opposed to any furthering of our knowledge of pre-Islamic Sudan, of Christian Nubia’s needs to change its understanding and accept alternative models of "development" other than hydro power, and what would mean flooding huge areas of land. It is this lobby that considers the false Arab genealogies of late 18th century Mecca as the key proof of our misguided, beastly delusion of Arabism that must be challenged. This view that ideologically rests upon the narrative purported by Ibn Kholdoun that Arab incursions succeeded in pacifying Nubia and its populations in their totality, and how our political identity is currently being fashioned. This lobby needs to be made to understand that the crime of destroying our land, to wipe out our history and our knowledge of it, will be in vain. As I write these lines, the Sudanese government of the "Islamic Republic of Sudan" - as the state would shortly and in due time be renamed to – is considering the construction of more new dams along the Nile. The exhibition is a subtle reminder of the fate that befell the Halfaweyeen and other Nubians in the 1960’s, but it is an actual documentation of what befell the Manaseer of the Fourth Cataract in the 2000’s. It is a warning of the danger facing a river, that was kind to its neighbours, but is constantly being exploited under the guise of development, to displace peaceful docile populations, impoverish them, and destroy histories buried under the sands of time, and the Nubian Desert. Mo Hashim is a Sudanese journalist living and working in the UK. He can be reached at ✉moehash@yahoo.com. Picture: Qubba of Shaykh Idris Ali al-Rady "Al-Mahjoub" resident of Kweika an early 19th century Sufi shaykh and khalifa of al-Khatmiya tariqa in Sai in the land of the Mahas. Photo: ST.
October 7, 2011 to February 19, 2012.